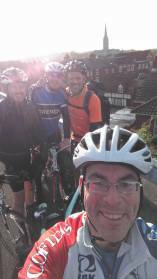 On Saturday 12th & Sunday 13th November 2016 four Peaky Climbers cycled the impressive 192 mile round trip from Wantage – Swanage – Wantage, passing through Oxfordshire, Wiltshire, Hampshire and Dorset along the way. 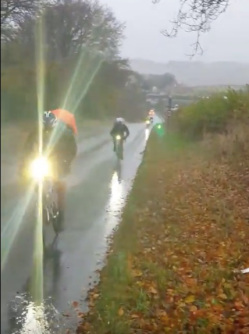 Nobby, Ben, Allen & Cricky set off at 07:00 am in horrendous conditions of heavy rain and a cold head wind as they embarked on two days of 6 ½ + hours in the saddle with the aim to learn from repetitive back-to-back day long rides as a Team. Morale was instantly boosted by the sight of Team Skipper, Macca waiting at the top of Manor Hill climb with his camera and loads of verbal rallies of support shouting “Allez allez Peakies” which typifies the togetherness of the Peaky Climbers team. The rain persisted all the way to Blanford Forum, 71 miles in, but the rain water on the roads of Dorset’s country lanes gave no rest bite as it sprayed off our back wheels. Team decisions were taken that due to the conditions we’d crack on and stay wet keeping breaks short and to a minimum, but a welcome hot coffee in a garage in Tidworth was very welcome. 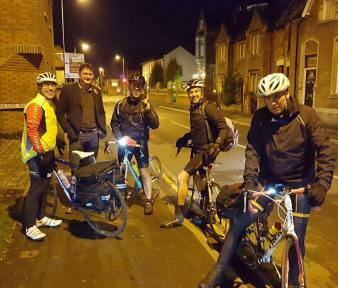 Cricky developed a worrying mechanical issue shortly after Salisbury when his pedal arm severely loosened and nearly fell off but with tools on board this was rectified in a short pit stop. As the Peaky Climbers approached the final 20 miles it was also decided to take on board a proper meal as the continuous undulating countryside was energy sapping, so they boys, still dripping with water but still in high spirits, were watered & fed in the Worlds End public house and met with a warm welcome too. A quick Team photo shoot at Corfe Castle was followed by brighter weather as train of Peakies meandered alongside the Purbeck Steam railway line into Swanage. On arrival in Swanage the Team were met by the hosts of their lovely B&B, bikes stored away, hot showers and headed to the launderette to dry the sodden clothing. 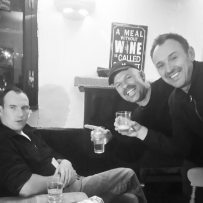 A great evening of high spirits was then enjoyed including a visit to the local Curry House and then liquid refreshment in the fine drinking establishment the Black Swan, where Ben then fell asleep and masculine Nobby & Allen drank a bottle of Baileys. After a mighty fine breakfast in the morning the team took to the roads again at 09:30am in glorious Dorset sun shine and were soon decanting layers in Corfe to compensate the change in weather conditions. The team then decided not to stop for another 40 miles as the Peaky Peleton rode as one at a slightly enhanced touring pace of 14mph, eventually pit stopping 7 mile short of Salisbury and apart from several saddle related pains the team were still fighting fit. A photo shoot with the Cathedral and a welcomed coffee stop were enjoyed in the Medieval City as the temperature started to drop dramatically. Shortly afterwards Allen & Ben experienced an altercation with the law as an unmarked police BMW nearly collided with Mr Stacey resulting in a traffic law debate which the Peakies won!! Thanks to Allen for quoting the CTC handbook word perfect. Morale was further dented when a planned meal stop ended in the boys being turned away with smell of Sunday roast rich in their nostrils and only then to stop in Tidworth for a below par toasted sandwich instead. Soldiering on the team hit the continuous climbing countryside with a hardened resolve and before long were rolling into Hungerford in the pitch black. As the Team re-grouped under the M4, Allen had stern words with Cricky & Nobby about Team riding ethics and his wise words were taken on-board and an apology was issued by the two over eager hill climbers. Little did they all know Mr Stacey’s words proved pivotal only 7 miles on as Ben suffered a huge sugar dip, becoming delirious and unstable on his bike. An extended rest stop with the team pumping energy supplements into the big man as he lay in the layby recovering. 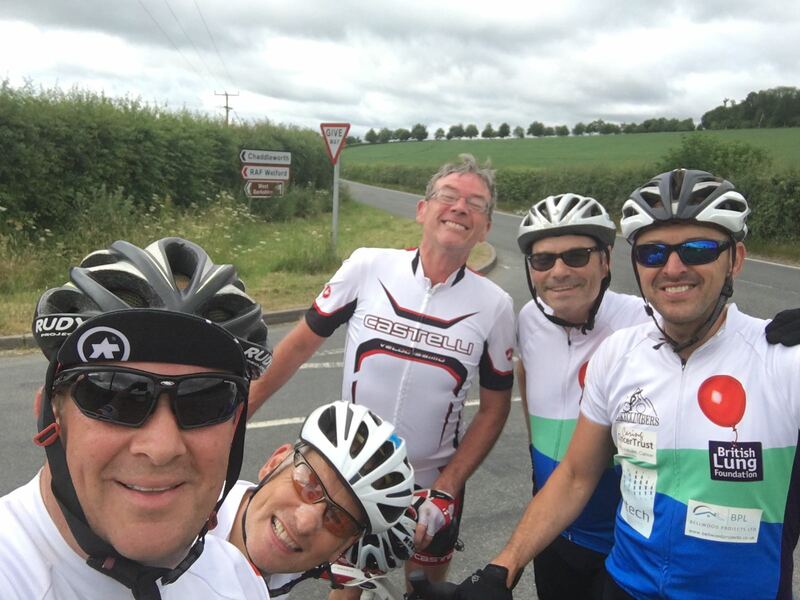 They then remounted as one climbed up to the ridgeway summit and descended into their home town to a warm homecoming from Skipper Macca and Team sponsor Steve Aram. Peaky Climbers is going to be a long road of pain, hills & big challenges but this was an amazing ride with loads of lessons learnt and a huge boost to Team morale ! !